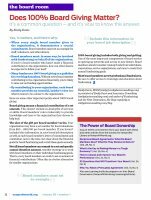 Home > Membership > Nonprofit World > Does 100% Board Giving Matter? Does 100% Board Giving Matter? It's a common question - and it's vital to know the answer.